The applicants who are willing to apply for OMFED Recruitment 2017 they should fill and submit the offline application form in the précised manner on or before 16th October 2017. Entire information such as eligibility criteria, selection process, salary package, apply process, last date, etc. are mentioned on this page. Contestant’s maximum age limits should be Below 35 Years As on 30-09-2017. Candidates who are meeting with the above detailed eligibility parameters they may apply by downloading the application through the official website www.omfed.com and send it to following address on or before 16th October 2017. Deadline to Submit Hard Copy of Application Form Is : 16-10-2017. The applicants who are willing to apply for HCC Recruitment 2017 they should fill and submit the offline application form in the précised manner on or before 23rd October 2017. Entire information such as eligibility criteria, selection process, salary package, apply process, last date, etc. are mentioned on this page. Qualification Details: Aspirants should have attained 10th / 12th from a recognized Board / University / Institute. Candidates who are applying should be between 18 to 25 Years. The organization shall conduct the Written Exam, Typing Test & Physical, Skill Test for the assortment of the applicants. Candidates who are meeting with the above detailed eligibility parameters they may apply by downloading the application through the official website www.indianarmy.nic.in and send it to following address on or before 23rd October 2017. The applicants who are willing to apply for Uttar Pradesh Legislative Assembly Secretariat Recruitment 2017 they should fill and submit the offline application form in the précised manner on or before 18th October 2017. Entire information such as eligibility criteria, selection process, salary package, apply process, last date, etc. are mentioned on this page. Candidates who are applying should be between 22 to 40 Years 01-07-2017. The organization shall conduct the Shorthand Test for the assortment of the applicants. Candidates who are meeting with the above detailed eligibility parameters they may apply by sending sending hard copy of application form with relevant document in prescribe format to following address on or before 18th October 2017. Last date to submit application form : 18-10-2017. The applicants who are willing to apply for CUK Recruitment 2017 they should fill and submit the online application form in the précised manner on or before 27th October 2017. Entire information such as eligibility criteria, selection process, salary package, apply process, last date, etc. are mentioned on this page. Qualification Details: Aspirants should have attained Graduation Degree / Post Graduation Degree / PG Diploma from a recognized Board / University / Institute. Candidates who are meeting with the above detailed eligibility parameters they may apply online for the application through the official website www.cuk.ac.in and send it to following address on or before 27th October 2017. Dead Line To Submit Online Application Is : 27-10-2017. Application Has To Be Sent Latest By : 10-11-2017. The applicants who are willing to apply for MILKFED Recruitment 2017 they should fill and submit the online application form in the précised manner on or before 18th October 2017. Entire information such as eligibility criteria, selection process, salary package, apply process, last date, etc. are mentioned on this page. Qualification Details: Aspirants should have attained ITI / Graduation Degree from a recognized Board / University / Institute. A non-refundable application fee of Rs. 700/- is needed to be paid by General Category Candidates. Contenders belonging to the SC / BC & Other Category : Rs. 500/-. Candidates who are applying should be between 18 to 45 Years As on 30-09-2017. The organization shall conduct the Written Test for the assortment of the applicants. Candidates who are meeting with the above detailed eligibility parameters they may apply online for the application through the official website www.verka.coop on or before 18th October 2017. Opening Date of Online Registration of Application Form Is : 26-09-2017. Online Application Will Be Received Till : 18-10-2017. The applicants who are willing to apply for SCCL Recruitment 2017 they should fill and submit the online application form in the précised manner on or before 20th October 2017. Entire information such as eligibility criteria, selection process, salary package, apply process, last date, etc. are mentioned on this page. Candidates who are meeting with the above detailed eligibility parameters they may apply online for the application through the official website www.scclmines.com on or before 20th October 2017. Closing Date For Apply Online : 20-10-2017. Click Here For SCCL Job Notification Link. The applicants who are willing to apply for BrahMos Aerospace Recruitment 2017 they should fill and submit the offline application form in the précised manner on or before 12th October 2017. Entire information such as eligibility criteria, selection process, salary package, apply process, last date, etc. are mentioned on this page. Qualification Details: Aspirants should have attained Engineering Degree from a recognized Board / University / Institute. Contestant’s maximum age limits should be Below 35 Years As on 01-10-2017. Candidates who are meeting with the above detailed eligibility parameters they may apply by sending sending hard copy of application form with relevant document in prescribe format to following address on or before 12th October 2017. Deadline to Submit Hard Copy of Application Form Is : 12-10-2017. The applicants who are willing to apply for District Magistrate Office Kabirdham Recruitment 2017 they should fill and submit the offline application form in the précised manner on or before 23rd October 2017. Entire information such as eligibility criteria, selection process, salary package, apply process, last date, etc. are mentioned on this page. Qualification Details: Aspirants should have attained 8th / Graduation Degree from a recognized Board / University / Institute. Candidates who are applying should be between 18 to 35 Years As on 01-01-2017. The organization shall conduct the Written Exam & Practical / Skill Test for the assortment of the applicants. Candidates who are meeting with the above detailed eligibility parameters they may apply by downloading the application through the official website www.ecourts.gov.in and send it to following address on or before 23rd October 2017. The applicants who are willing to apply for CATD Recruitment 2017 they should should attend walkin interview on 7th October & 8th October 2017. Entire information such as eligibility criteria, selection process, salary package, apply process, last date, etc. are mentioned on this page. Qualification Details: Aspirants should have attained 5th / 12th / Diploma / Graduation Degree / Master’s Degree from a recognized Board / University / Institute. Candidates who are applying should be between 30 to 45 Years (Post 8). Contestant’s maximum age limits should be Below 40 Years (Post 1,2,5), 35 Years (Post 3,4,6,9-11,15), 30 Years (Post 7,16,17), 27 Years (Post 12), 45 Years (Post 13,14). Candidates who are meeting with the above detailed eligibility parameters must attend walkin interview on 7th October & 8th October 2017. The applicants who are willing to apply for CG Transport Recruitment 2017 they should fill and submit the offline application form in the précised manner on or before 16th October 2017. Entire information such as eligibility criteria, selection process, salary package, apply process, last date, etc. are mentioned on this page. Candidates who are applying should be between 18 to 30 Years As on 01-01-2017. The organization shall conduct the Driving Test & Personal Interview for the assortment of the applicants. Candidates who are meeting with the above detailed eligibility parameters they may apply by downloading the application through the official website www.cgtransport.org and send it to following address on or before 16th October 2017. The applicants who are willing to apply for UKMRC Recruitment 2017 they should fill and submit the offline application form in the précised manner on or before 7th October 2017. Entire information such as eligibility criteria, selection process, salary package, apply process, last date, etc. are mentioned on this page. Qualification Details: Aspirants should have attained 12th / Graduation Degree / Post Graduation Degree from a recognized Board / University / Institute. Candidates who are meeting with the above detailed eligibility parameters they may apply by downloading the application through the official website www.ukmrc.org and send it to following address on or before 7th October 2017. Last Date of Receipt of Applications : 07-10-2017. The applicants who are willing to apply for District Magistrate Office Purulia Recruitment 2017 they should fill and submit the offline application form in the précised manner on or before 23rd October 2017. Entire information such as eligibility criteria, selection process, salary package, apply process, last date, etc. are mentioned on this page. Contestant’s maximum age limits should be Below 64 Years As on 24-10-2017. Candidates who are meeting with the above detailed eligibility parameters they may apply by sending sending hard copy of application form with relevant document in prescribe format to following address on or before 23rd October 2017. Deadline for Receiving Hard Copy of Application Form Is : 20-10-2017. Date for Personal Interview : 24-10-2017. The applicants who are willing to apply for DSWSE Recruitment 2017 they should fill and submit the offline application form in the précised manner on or before 20th October 2017. Entire information such as eligibility criteria, selection process, salary package, apply process, last date, etc. are mentioned on this page. Qualification Details: Aspirants should have attained 5th / 10th / Graduation Degree from a recognized Board / University / Institute. Candidates who are meeting with the above detailed eligibility parameters they may apply by downloading the application through the official website www.tripurawelfare.nic.in and send it to following address on or before 20th October 2017. Closing Date for Forwarding Filled Application Forms : 20-10-2017. The applicants who are willing to apply for CONCOR Recruitment 2017 they should fill and submit the offline application form in the précised manner on or before 15th October 2017. Entire information such as eligibility criteria, selection process, salary package, apply process, last date, etc. are mentioned on this page. Candidates who are applying should be between 14 to 21 Years As on 01-10-2017. Candidates who are meeting with the above detailed eligibility parameters they may apply by downloading the application through the official website www.concorindia.com and send it to following address on or before 15th October 2017. Closing Date to Submit Hard Copy of Application Form Is : 15-10-2017. The applicants who are willing to apply for ANIIMS Recruitment 2017 they should fill and submit the application form in the précised manner through Email on or before 30th September 2017. Entire information such as eligibility criteria, selection process, salary package, apply process, last date, etc. are mentioned on this page. Contestant’s maximum age limits should be Below 40 Years. Candidates who are meeting with the above detailed eligibility parameters they may apply by sending sending soft copy of application form with relevant document in prescribe format to following Email address on or before 30th September 2017. Last date for receving application form through email is :30-09-2017. The applicants who are willing to apply for MLSU Recruitment 2017 they should fill and submit the online application form in the précised manner on or before 25th September 2017. Entire information such as eligibility criteria, selection process, salary package, apply process, last date, etc. are mentioned on this page. Candidates who are meeting with the above detailed eligibility parameters they may apply online for the application through the official website www.mlsu.ac.in and send it to following address on or before 25th September 2017. Last Date of On-line registration : 25-09-2017. Last Date for Receiving Hard Copy of Application Form Is : 30-09-2017. The applicants who are willing to apply for Weavers Service Centre Recruitment 2017 they should fill and submit the offline application form in the précised manner on or before Within 45 Days. Entire information such as eligibility criteria, selection process, salary package, apply process, last date, etc. are mentioned on this page. Qualification Details: Aspirants should have attained 10th / ITI / Diploma from a recognized Board / University / Institute. The organization shall conduct the Written Exam, Practical Test for the assortment of the applicants. Candidates who are meeting with the above detailed eligibility parameters they may apply by downloading the application through the official website www.handlooms.nic.in and send it to following address on or before Within 45 Days. Last Date for Receiving Hard Copy of Application Form Is (Remote areas / Flung Areas) : Within 52 Days. The applicants who are willing to apply for IPRCL Recruitment 2017 they should fill and submit the offline application form in the précised manner on or before 30th September 2017. Entire information such as eligibility criteria, selection process, salary package, apply process, last date, etc. are mentioned on this page. Candidates who are meeting with the above detailed eligibility parameters they may apply by downloading the application through the official website www.iprcl.org and send it to following address on or before 30th September 2017. The applicants who are willing to apply for Zila Parishad Mansa Recruitment 2017 they should fill and submit the offline application form in the précised manner on or before 22nd September 2017. Entire information such as eligibility criteria, selection process, salary package, apply process, last date, etc. are mentioned on this page. Candidates who are meeting with the above detailed eligibility parameters they may apply by sending sending hard copy of application form with relevant document in prescribe format to following address on or before 22nd September 2017. Application Has To Be Sent Latest By : 22-09-2017. The applicants who are willing to apply for Rajasthan Vidhan Sabha Recruitment 2017 they should fill and submit the online application form in the précised manner on or before 11th October 2017. Entire information such as eligibility criteria, selection process, salary package, apply process, last date, etc. are mentioned on this page. Qualification Details: Aspirants should have attained 5th / Graduation Degree from a recognized Board / University / Institute. A non-refundable application fee of Rs. 150/- (Post 1), 500/- (Post 2) is needed to be paid by General / OBC Category Candidates. Contenders belonging to the ST / SC of Rajasthan & Other Category : Rs. 100/- (Post 1), 250/- (Post 2). The organization shall conduct the Typing Test, Stenography Test & Personal Interview. for the assortment of the applicants. Candidates who are meeting with the above detailed eligibility parameters they may apply online for the application through the official website www.rajassembly.nic.in on or before 11th October 2017. Last Date To Apply Online Is : 11-10-2017. The applicants who are willing to apply for Directorate of Panchayat Chhattisgarh Recruitment 2017 they should fill and submit the online application form in the précised manner on or before 30th September 2017. Entire information such as eligibility criteria, selection process, salary package, apply process, last date, etc. are mentioned on this page. Qualification Details: Aspirants should have attained 12th / Diploma / Graduation Degree / Engineering Degree / Post Graduation Degree from a recognized Board / University / Institute. The organization shall conduct the Written Exam / Personal Interview / Practical Test for the assortment of the applicants. Candidates who are meeting with the above detailed eligibility parameters they may apply online for the application through the official website www.prd.cg.gov.in on or before 30th September 2017. Starting Date of Online Application Form Filling Is : 16-09-2017. Online Application Will Be Received Till : 30-09-2017. The applicants who are willing to apply for DCHS Recruitment 2017 they should fill and submit the offline application form in the précised manner on or before 29th September 2017. Entire information such as eligibility criteria, selection process, salary package, apply process, last date, etc. are mentioned on this page. Candidates who are applying should be between 34 to 42 Years As on 30-09-2017. Candidates who are meeting with the above detailed eligibility parameters they may apply by downloading the application through the official website www.anantapuramu.ap.gov.in and send it to following address on or before 29th September 2017. Last Date to Submit Filled-In Application : 29-09-2017. The applicants who are willing to apply for PUCBL Recruitment 2017 they should fill and submit the offline application form in the précised manner on or before 29th September 2017. Entire information such as eligibility criteria, selection process, salary package, apply process, last date, etc. are mentioned on this page. Contenders belonging to the Reserved & Other Category : Rs. 200/-. Contestant’s maximum age limits should be 50 Years (Post 1-11), 45 Years (Post 12-14). Candidates who are meeting with the above detailed eligibility parameters they may apply by downloading the application through the official website www.pusadurbanbank.com and send it to following address on or before 29th September 2017. Closing Date to Submit the Application Form : 29-09-2017. 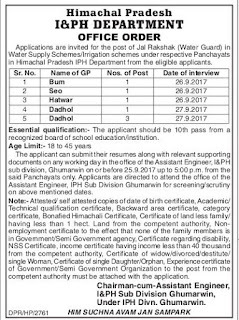 The applicants who are willing to apply for Sainik School Ghorakhal Recruitment 2017 they should fill and submit the offline application form in the précised manner on or before Within 21 Days. Entire information such as eligibility criteria, selection process, salary package, apply process, last date, etc. are mentioned on this page. A non-refundable application fee of Rs. 200 /- is needed to be paid by All Category Candidates. Candidates who are applying should be between 18 to 50 Years As on 01-09-2017. Candidates who are meeting with the above detailed eligibility parameters they may apply by downloading the application through the official website www.ssghorakhal.org and send it to following address on or before Within 21 Days. Closing Date to Submit the Application Form : Within 21 Days. The applicants who are willing to apply for IPHD Recruitment 2017 they should fill and submit the offline application form in the précised manner on or before 25th September 2017. Entire information such as eligibility criteria, selection process, salary package, apply process, last date, etc. are mentioned on this page. Candidates who are meeting with the above detailed eligibility parameters they may apply by downloading the application through the official website www.hpiph.org and send it to following address on or before 25th September 2017. The applicants who are willing to apply for BPPI Recruitment 2017 they should fill and submit the offline application form in the précised manner on or before 15th October 2017. Entire information such as eligibility criteria, selection process, salary package, apply process, last date, etc. are mentioned on this page. Contestant’s maximum age limits should be Below 60 Years As on 01-10-2017. Candidates who are meeting with the above detailed eligibility parameters they may apply by downloading the application through the official website www.janaushadhi.gov.in and send it to following address on or before 15th October 2017. Deadline to Submit the Application Is : 15-10-2017. The applicants who are willing to apply for NSPCL Recruitment 2017 they should fill and submit the online application form in the précised manner on or before 10th October 2017. Entire information such as eligibility criteria, selection process, salary package, apply process, last date, etc. are mentioned on this page. A non-refundable application fee of Rs. 150/- is needed to be paid by General / OBC Category Candidates. Contenders belonging to the PH / ST / SC / Ex-S Category : Nil. Contestant’s maximum age limits should be above 27 Years As on 10-10-2017. The organization shall conduct the GATE Score 2017, Merit List & Personal Interview for the assortment of the applicants. Candidates who are meeting with the above detailed eligibility parameters they may apply online for the application through the official website www.nspcl.co.in on or before 10th October 2017. Online Registration Would Be Open From : 19-09-2017. Dead Line of Online Application Is : 10-10-2017. The applicants who are willing to apply for Kerala State IT Mission Recruitment 2017 they should fill and submit the offline application form in the précised manner on or before 25th September 2017. Entire information such as eligibility criteria, selection process, salary package, apply process, last date, etc. are mentioned on this page. Contestant’s maximum age limits should be 45 Years (Post 1,2), 35 Years (Post 3-8). Candidates who are meeting with the above detailed eligibility parameters they may apply by downloading the application through the official website www.itmission.kerala.gov.in and send it to following address on or before 25th September 2017. Last Date to Submit Filled-In Application : 25-09-2017.